“the flip-flop (n.) the process of pushing a work of art or craft from the physical world to the digital world and back again—maybe more than once” (Sloan, 2012). 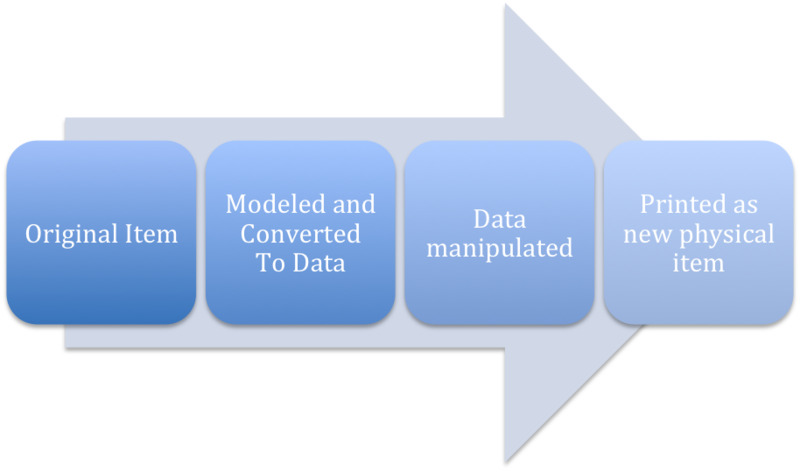 There is the original physical items which is then modeled and converted to data. At that point the data can be manipulated and reworked before finally being printed out again as a new object made of a new material. However it seems disadvantageous to think of “Making” as a cycle or process. By thinking along the lines of this cycle all of the value gets placed on the final project. Either for or against 3-D printing the value of the object printed seems hard qualify. Lee Rosenbaum finds them “counter productive” but it is not so clear what type of thing would be more productive. Liz Neely’s says the printed objects provide a “deeper engagement through the quality of the interaction” but I am not sure why holding a piece of plastic is more valuable than looking at a TV screen. Maybe it is, but I find it interesting that its so hard to quantify the value of the 3-D printed objects. I find it interesting that it is hard to find a quantifiable value in the objects being created, from original objects, that have a high value (at least in the reading examples) whether monetarily, aesthetically or historically. The printing of the object is almost mentioned in passing. The real value is in the data and the digitization process. This is what allows the patron to “construct, scrutinize, produce, share, trace and map.” Printing the object out is not contingent of any of these steps. It might be nice to printing something and hold it, but it is hard for me to see the real value in it. Creating a new item on a computer and printing it out.